Not included in the rate, but it is appreciated. $4 per day for cars and $2 per day for bikes. The nearest airport to Scala is Gelendzhik, located 7km from the site. There is airport transportation available, inquire for more details. 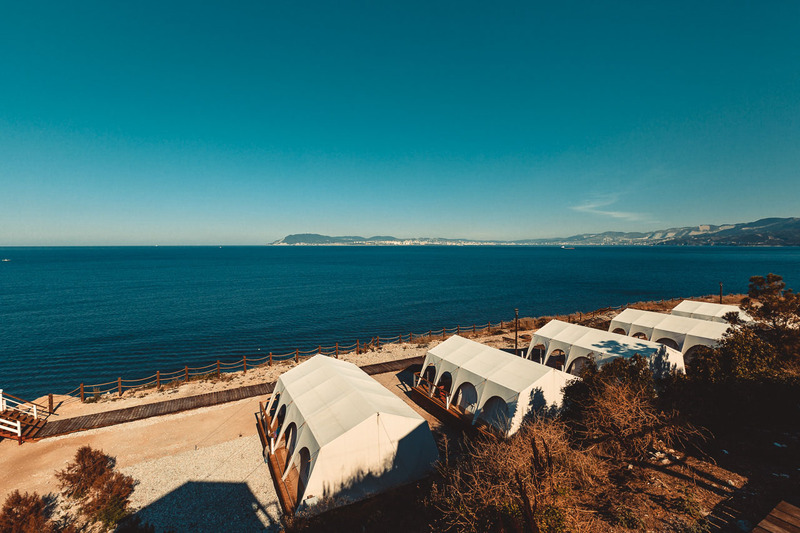 Scala combines European-level camping on the sea with the services of a 3-star hotel. The pricing policy of the property is democratic, which makes camping in Gelendzhik affordable for many glampers. The territory has its own beach that is 150 meters long. Scala is the first property in Russia to use Safari-Tents (50 m²) with private terraces. The bases for standard tents are prepared from a sand cushion, with electricity supplied to each place. Scala provides the ideal camping experience for families with children as it has a cozy beach and children's playground on site. The Forest Thicket properties are fully-equipped tents located on the Black sea in complete privacy in the center of delightful, local nature. With 40 seats available, all with a natural base in the beautiful thicket on the campsite, this area provides accommodation for a maximum of four people. The total area of each tent is 50 square meters. Each tent has its own spacious terrace where guests can enjoy excellent views. The main structure consists of 3 rooms: 2 bedrooms and an entrance hall. Internal equipment of tents includes beds, bedside tables, table lamps, as well as wardrobe and chest of drawers in the hallway. There are tables and chairs for guests to use on the terrace. There are centralized toilets and showers with hot water near the tent. A magical adventure, just steps from the beach. It is suggested that guests bring swimming trunks, swimsuits, sneakers, and sun cream.